Our enterprise is involved in manufacturing and supplying a wide range of Examination Lights with LED (Item Code: O.T.L. -01 LED). The extensive array is made of superior grade materials like glass, fiber cover & metal rods that are procured from the reliable vendors of the industry. We design examination lights withLED of varied wattage capacities to help the surgeons and general physicians in their patient diagnosis and treatment processes. Our operation table lights are appreciated for the properties like light weight, high illumination capacity and low electricity consumption. the unit moved on polyproplene made base with 5 spokes, wheel are also made of Plastic, easy to rotate on floor, stand made of Black powder coated finish M.S. pipe, Small dome made of Black Colour provided with handle to rotate the head, ON and Off switch, one controller on the stand which carry the transformer inside to control the power, flexible arm for easy movement of the light at any angle as per user requirment. supplied in knockdown condition in one Box, power cord attached with light. Our enterprise is involved in manufacturing and supplying a wide range of Examination Lights Halogen type (Item Code: O.T.L. -01). The extensive array is made of superior grade materials like glass, fiber cover & metal rods that are procured from the reliable vendors of the industry. We design examination lights with halogen lamps of varied wattage capacities to help the surgeons and general physicians in their patient diagnosis and treatment processes. Our operation table lights are appreciated for the properties like light weight, high illumination capacity and low electricity consumption. the unit moved on polyproplene made base with 5 spokes, wheel are also made of Plastic, easy to rotate on floor, stand made of Black powder coated finish M.S. 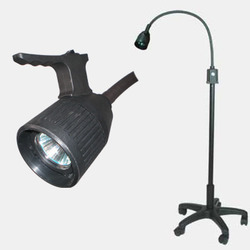 pipe, Small dome made of Black Colour provided with handle to rotate the head, ON and Off switch, one controller on the stand which carry the transformer inside to control the power, flexible arm for easy movement of the light at any angle as per user requirment. supplied in knockdown condition in one Box, power cord attached with light. We are one of the renowned manufacturers and exporters of O.T. Lights (Item Code: O.T.L-02). Our operation table lights are offered in varied categories like Single 14” Dome, Single Dome, Dome 19” and Double Dome with reflectors. 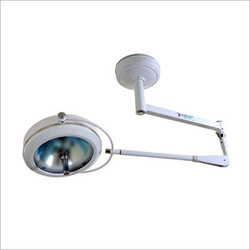 OT lights are extensively used in Nursing Homes, Treatment Centers and Private Clinics. These electrical appliances are available in multiple illumination capacities to cater the specific needs of Physicians and surgeons. Our electrical appliances are applauded for the properties like shock proof body and power saving halogen bulbs. Being an ISO 9001 certified organization, we are involved in manufacturing of ceiling suspension shadowless operation light twin model (item code: O. T. L-03). Our shadowless ot lights are provided with twin halogen bulbs of 24 volts and 70 watts capacity. Chief components of the ot lights are color correcting glass filters, removable handle, low voltage transformer and halogen bulbs. Our ot lights are acknowledged for the properties like low power consumption, easy portability and light weight. We manufacture our all ot lights using high performance components. Accompany double dome one with 7 reflector and another is 4 reflector, satalite dome can move at 360 degree. 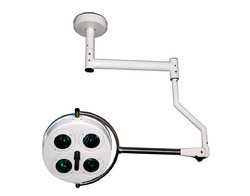 A dual head, identical ceiling mounted surgical light unit is to feature Shadows less illumination High illumination level of > 140,000 per each head Good color temperature of approximate 4200K Cool light with low heat emission above the surgeon head Ergonomic shape hygienic & easy to clean Stable movement controls Brightness adjustment. Focal adjustment Sterilizable handgrip. Preferable two switching keypads, one on the light system & the second one room surgical control panel. both time dome has 4 reflector for better illumination. 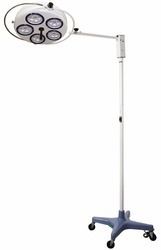 Fully spring balanced improved light with parabolic vacuum metalised highly mirror finished reflectors - each fitted with a halogen bulb of 24v-70w and special heat absorbing glass filters. Easy manoeuverability by a removable type sterilize able handle fitted in the middle of the dome. Supplied with low voltage transformer unit with intensity selector switch. Angular, radial and axial movements easily maneuverable. Beautifully designed & nicely pearl finished. Light intensity 40, 000 + lux. 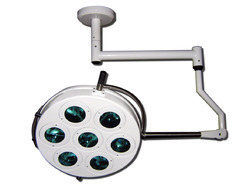 four reflector light give high illuminatation and better light to operate any kind of surgeries. Improved high technology light deliver high intensity cold light. Fully Spring balanced. Fitted with halogen bulb of 24V-150W and special heat absorbing & colour correcting filter glass. Reserve light source with double bulb system, and auto cut dimmer control. A removable type sterilize able handles fitted in the middle of each dome for easy maneuverability of light during surgery. Completely rust proof, beautifully designed and finished in white pearl paint. Light intensity 40,000 + Lux. Fully spring balanced improved light with parabolic vacuum metalized highly mirror finished reflectors - each fitted with a halogen bulb of 24V-70W and special heat absorbing glass filters. Easy maneuverability by semi circular handle fitted outside the do em. Supplied with low voltage transformer unit with intensity selector switch. Angular, radial and axial movements easily maneuverable. Beautifully designed & nicely pearl finished. Light intensity 50,000 + Lux. Fully spring balanced improved multi reflector single dome light supplied with built-in concealed low voltage transformer fitted inside the base, mounted on special castors. Each reflector fitted with a 24V-70W halogen bulb and special thermal filter glass for heat absorbing & colour correcting light. Provided with a removable type sterilize able handle fitted in the middle of dome for easy maneuverability of light. Nicely designed and finished in white pearl paint. Light intensity 40,000 + Lux. 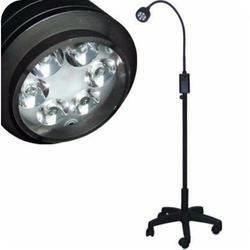 Rajas offers Examination Lights LED with Battery Back up (Item Code: O.T.L. -01 LED BATTERY BACK UP). We design examination lights withLED of varied wattage capacities to help the surgeons and general physicians in their patient diagnosis and treatment processes. Our operation table lights are appreciated for the properties like light weight, high illumination capacity and low electricity consumption. the LED examination light with battery back up of 1-2 hour, it can run on main power as well as on battery back up for 1-2 hours after full charging, dry battery give a unique back up and charge very quickely from main when power is ON, the unit moved on polyproplene made base with 5 spokes, wheel are also made of Plastic, easy to rotate on floor, stand made of Black powder coated finish M.S. pipe, Small dome made of Black Colour provided with handle to rotate the head, ON and Off switch, one controller on the stand which carry the transformer inside to control the power, flexible arm for easy movement of the light at any angle as per user requirment. supplied in knockdown condition in one Box, power cord attached with light.